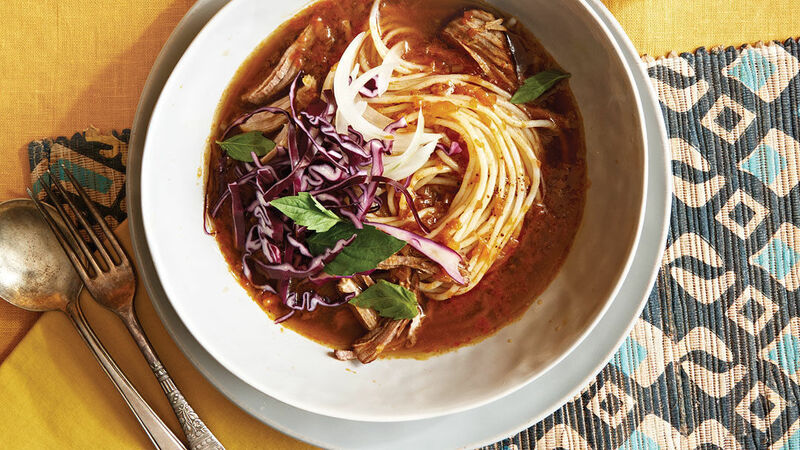 While pho may grab the limelight, there’s much to love about the lesser-known bun bo hue. This robust and satisfying soup from the central Vietnamese city of Hue hits all the right notes: sour, salty, sweet, and spicy. Its meaty broth and thick glossy noodles make it the perfect main-course soup. Generously season the ribs and pork with salt and pepper. Heat 3 Tbs. of the peanut oil in a large Dutch oven or other heavy-duty pot over medium-high heat, and working in batches, sear the meat until golden brown on all sides, 1 to 2 minutes per side. Transfer to a large plate or bowl. Lower the heat to medium low. Add the ginger, garlic, and lemongrass, and cook, stirring often, for about 1 minute. Add the vinegar, stirring to scrape up the brown bits on the bottom of the pot, then add the sugar, stock, 6 cups of water, and the meat and any accumulated juices. Bring to a boil. Reduce the heat to medium low, cover, and simmer for 2 to 3 hours, until the meat is fork-tender. Turn the meat occasionally, and skim the broth if necessary. Transfer the meat to a large plate, and strain the broth through a fine-mesh strainer lined with cheesecloth, skimming off any excess fat. Wipe out the pot, and return the broth to the pot. Meanwhile, in a small skillet, heat the remaining 1 Tbs. peanut oil over medium heat. Add the chili oil, annatto seeds, shallots, and shrimp paste, and cook, stirring often, until the shallots begin to brown, 3 to 5 minutes. Add the shallot mixture and 1/2 tsp. salt to the broth, and simmer, uncovered, for another 30 minutes. Shred the meat into bite-size pieces, discarding any excess fat; add to the broth, season to taste with salt, and keep warm. Divide the noodles among 4 to 6 large, shallow bowls. Add some of the broth and meat, and garnish with the basil, cabbage, and onions. Drizzle with sesame oil, and serve the with chili oil on the side.